I have a soft spot in my heart for aloe plants. As someone with a notoriously brown thumb, houseplants have never really been my cup of tea. But thanks to sensitive skin and an occasionally fiery immune system, I took a chance one day and brought a few aloes home from the farmer’s market. At the very least, I thought I could get some use out of them before they’d take the walk of shame to the trash can. But 10 years, two pets and three houses later, those same aloe plants are thriving. Seriously, thriving! And not a day goes by that I don’t use them in some way or another. But using fresh aloe is a bit different (and better for you!) than using the bottled kind. 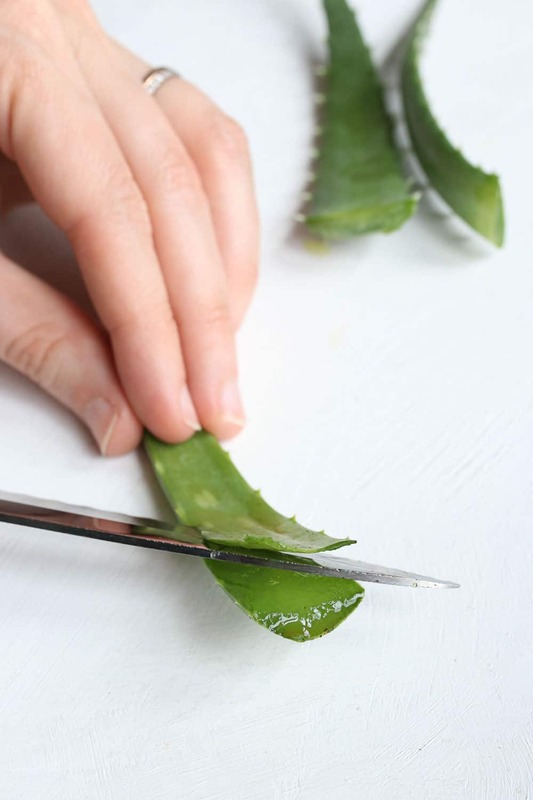 Here’s how to harvest and use aloe so you can get the most benefit from this magical plant. By now I think we’re all familiar with the topical uses of aloe. It’s a fabulous healer for burns, cuts and other skin ailments, and it has beauty-boosting properties to boot. 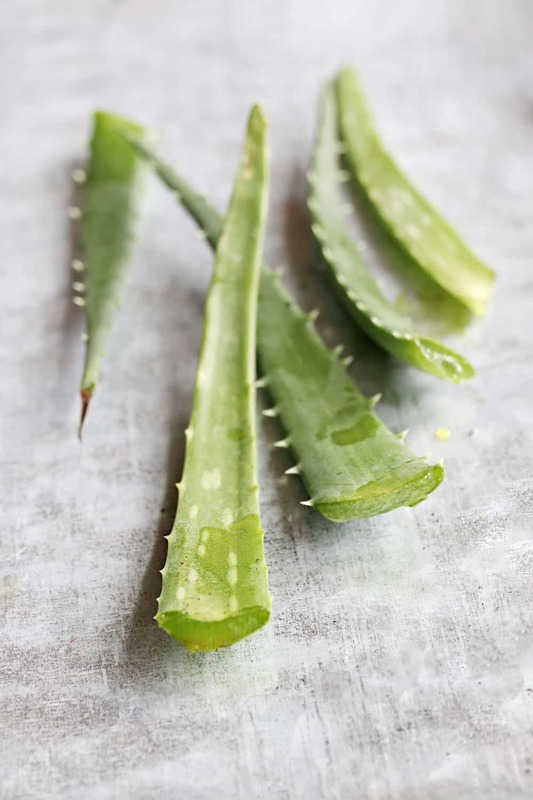 Thanks to an array of vitamins, minerals and phytonutrients, aloe vera is an anti-inflammatory powerhouse. But it’s not just your skin that reaps the benefits. 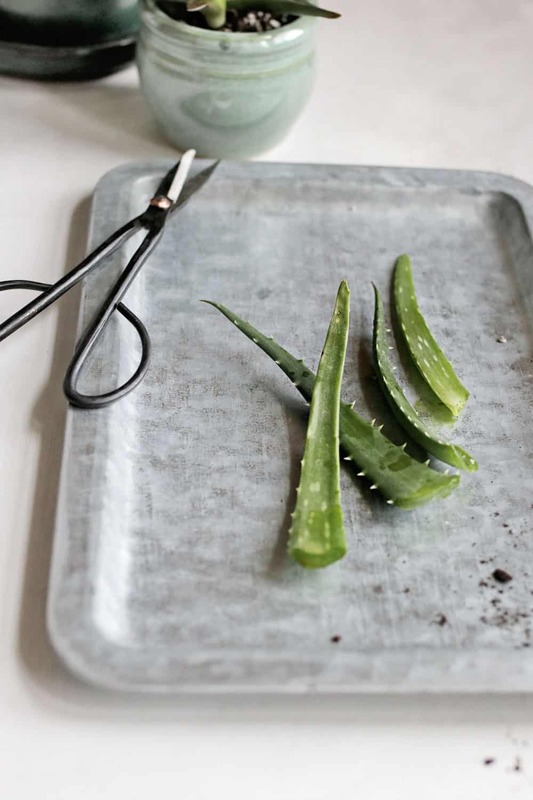 Aloe’s healing properties work just as well on our insides as they do on our outsides. When eaten, aloe vera aids digestion, decreases inflammation and promotes healing of the digestive tract. And for those of us with brown thumbs, aloe is one of those set-it-and-forget-it plants that does best when you don’t over-tend to it. With minimal effort, aloes will thrive in most households–even with little sunlight and water. Simply choose a large enough pot and some dry, sandy soil (like the kind you would buy for cacti), and place it near a bright window. Direct sun can burn the leaves so don’t panic if your home doesn’t get a ton of sunlight. Water it ever few weeks, letting it dry out between waterings. That’s it. On those occasions where you can’t use all the gel immediately, feel free to toss it in the refrigerator for a few days. Just keep in mind that aloe does degrade slightly over time, so don’t let it sit for too long. For long term storage, simply cut the leaf (with or without skin) into cubes and freeze until solid. Transfer the chunks to a lidded container and store in the freezer until ready to use. 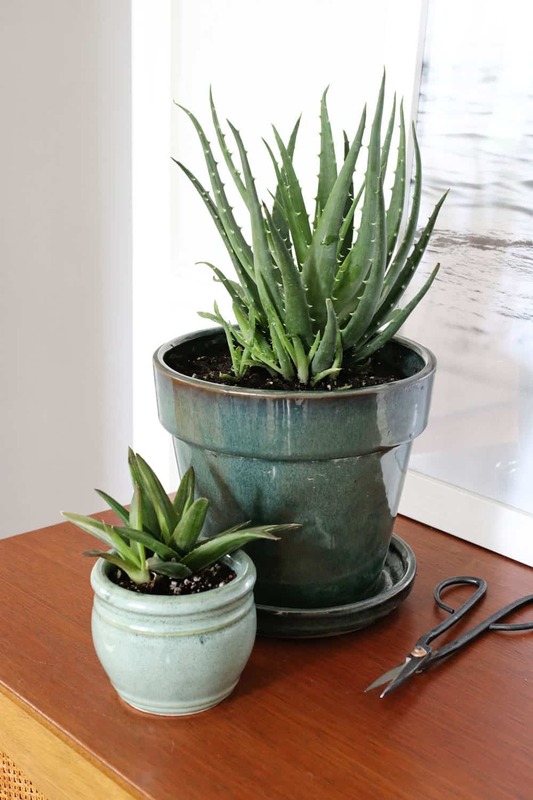 Choose a large, unblemished leaf from a mature aloe plant. Since most of the nutrients are housed near the stem, use sharp scissors to cut the leaf as close to the stem as possible. Let the yellow sap drain from the leaf, then rinse it and pat it dry. Lay the leaf on a flat surface and use a serrated knife to remove the top piece of skin. Flip the leaf over and remove the bottom piece of skin. Discard remaining stalk and rind. Apply the gel directly to skin or freeze and apply to inflamed skin, cuts or wounds. To eat, add to smoothies, drinks or salad dressings immediately after harvesting. After this is harvested can it be used in bath products like scrubs or lip balms? I have a aloe plant that has really done great for the first time in my life. I was so proud of it BUT… a few days ago, it just kind of laid down, the whole plant is now not looking good. What can I do and why did this happen to my healthy pride and joy aloe? HELP ASAP, PLEASE. 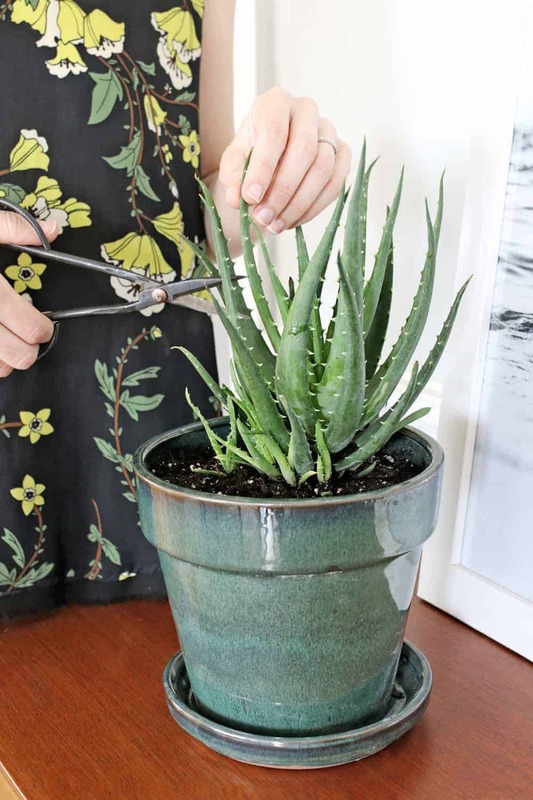 If aloe gets too much water it can go limp. It does best when watered and allowed to dry out then watered again. Make sure also you have good drainage so the roots don’t rot :) If you still have the roots, you can cut off the bad leaves and it might perk up again. Agreed. There are a good number of them. I understand the need to advertise but it’d be great if you could cut down the number of ads throughout an article. Theres a video on this at nutritionfacts.org that says the total opposite. That is so good to know I didn’t know the legits of a aloe plant I have a huge one in my home. I bought it from Home Depot my daughter loves it and she applies it to her face and skin. I wasn’t aware of a total care of the plant and now I have some ideas and what I need to do to take care of it thank you.